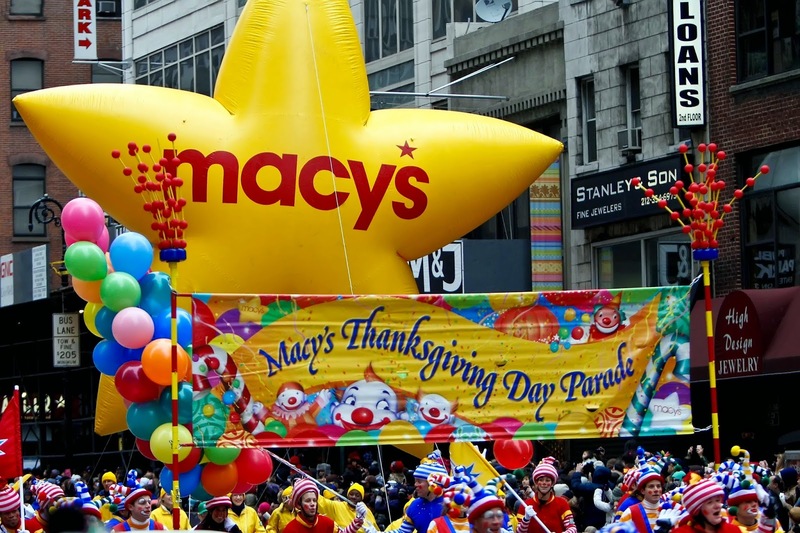 Macy’s Thanksgiving Day Parade 2014 | Map, When and Where To Watch Live Stream Video. 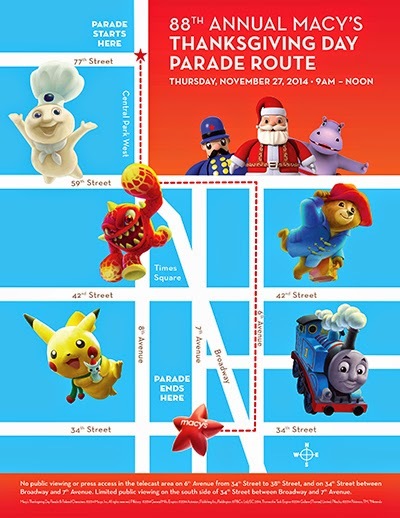 The annual parade presented by the U.S.-based retail store chain Macy's. The parade tradition started in 1924, tying it for the second-oldest Thanksgiving parade in the United States, along with America's Thanksgiving Parade in Detroit. The three-hour Macy's event is held in New York City starting at 9:00 a.m. and televised nationally on NBC since 1952. The largest of the novelty balloons typically require approximately 30 handlers. 2014: Pikachu Holiday version (third version), Thomas the Tank Engine, Paddington Bear, Skylanders, Red Power Ranger. In addition to the well-known balloons and floats, the Parade also features live music and other performances. College and high school marching bands from across the country participate in the parade, and the television broadcasts feature performances by famous singers and bands. Every year, cast members from a number of Broadway shows perform either in the parade, or immediately preceding the parade in front of Macy's. Along with the Broadway performances, the Rockettes have performed annually since 1957 as the last of the pre-parade acts to perform. More than 44 million people watch the parade on television each year. It was first televised locally in 1939 as an experimental broadcast. Radio coverage is provided by CBS Radio-owned WINS (1010 AM) in New York City. It is one of the few times throughout the year in which that station breaks away from its all-news radio format. The Parade has always taken place in Manhattan, one of the Five Boroughs that make up New York City. Originally the parade started from 145th Street in Harlem and ended at Herald Square, a 6-mile route. To ensure a good viewing location, get there early. Spectators arrive as early as 6:30am. - Columbus Circle: the west side of the street. The parade is one of New York’s favorite pastimes and is now in its 88th year. It has become a fixture on many people’s holiday calendars, whether they’re bundled up on the curb of Sixth Avenue or sitting cozy in their recliners at home, watching on TV. If you don’t feel like braving the crisp fall weather or crowds and would rather watch from home, tune in to NBC Thursday morning. The parade will also air on CBS starting at 9:00 a.m.